Tenkeyless Keyboard is a small form factor keyboard without numpad or numeric keypad. It is a compact and minimalist keyboard and is very popular among gamers. These TKL keyboards generally have 87 keys on them as standard. 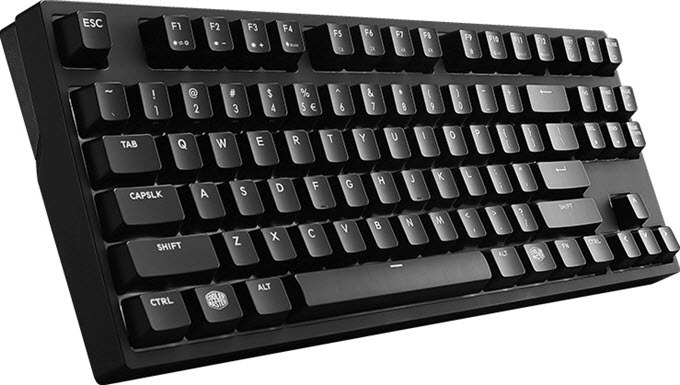 Most of the Tenkeyless or TKL keyboards are mechanical keyboards having Cherry MX or Cherry MX clone switches. But it is better to buy a Tenkeyless Mechanical Keyboard with genuine Cherry MX switches because they are far more reliable and have better typing experience compared to the Chinese mechanical switches that are clones of the Cherry MX switches. The main advantage of a tenkeyless keyboard is that it requires less space on your desk and are more portable compared to the full-sized keyboards with number pad. If you want a good keyboard for your laptop then Tenkeyless Mechanical Keyboard is a perfect choice because they offer the goodness of mechanical keys and it is easier to carry them around because they can fit in standard sized laptop bag quite comfortably. They also weigh less than the full-sized mechanical keyboards which is an added advantage. I personally have a Tenkeyless Mechanical Keyboard for my travel use with laptop and it is far more comfortable to type on a TKL mechanical keyboard compared to laptop keyboard. With Tenkeyless Mechanical Keyboard you can place your mouse closer the body and this helps in gaming, especially in fast paced FPS games that requires quick mouse movement. This also avoids strain on your shoulder and you feel more comfortable during gaming sessions. Tenkeyless Mechanical Keyboards have their special place in computer hardware and most of the enthusiasts and gamers do prefer them more. Also, some of the users who do a lot of typing and coding have affinity to these TKL mechanical keyboards because they find it more comfortable to use. So, here in this post I am going to list down the best tenkeyless mechanical keyboards for gaming and for typing work. Note: If you need to add a number pad in future to your tenkeyless mechanical keyboard then you can buy the numeric keypad online. These number pads come with USB connectivity and can be easily removed and attached depending on your need. Here are the best budget Tenkeyless Mechanical Keyboards under 100 dollars for gaming and typing use. These keyboards come with genuine Cherry MX switches and are very reliable and durable. Most of the below mentioned tenkeyless mechanical keyboards have LED backlighting. HyperX Alloy FPS Pro is one of the best tenkeyless mechanical gaming keyboards that you can get under 100 dollars. The keyboard comes with Cherry MX Red or Blue switches. Cherry MX Red are linear switches that are suited best for gaming while Cherry MX Blue are tactile & clicky switches and are best for typing. Unfortunately, there is no Cherry MX Brown switch variant of this TKL keyboard. The build quality of this mechanical keyboard is superb and it feels heavy. The frame of this TKL keyboard is made of steel and it really feels very solid to type on. 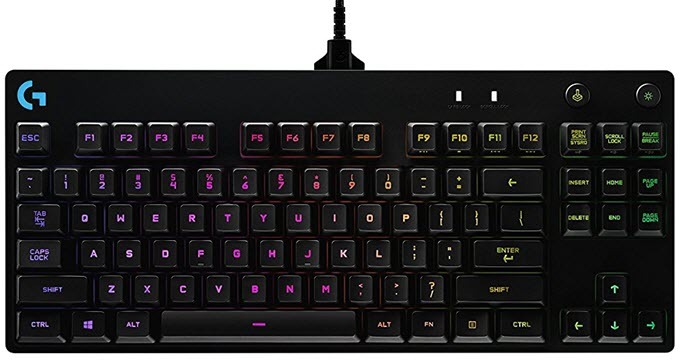 This is a great keyboard for FPS gaming and it also qualifies as a very good typing keyboard especially the Cherry MX Blue variant. This TKL mechanical keyboard comes with gaming features such as 100-per cent Anti-Ghosting and N-key rollover functions and Game Mode to lock Windows key. The keycaps are made up of ABS plastic and have pretty good quality and feel. The keycaps are illuminated by Red LED lighting beneath it and you can also change the lighting effects and adjust their brightness using the FN key, which is also used to initiate multimedia shortcuts on the function keys. The keyboard has LED indicators for Game Mode and Caps Lock. The keyboard features floating keys design which makes it easier to clean and maintain. It comes with a detachable USB cable which braided for extra durability and protection from sharp objects. The keyboard is very competitively priced and is one of the cheapest high quality and branded TKL mechanical keyboards that you can get. Highly Recommended by me for Gaming and Typing. This is a professional high-performance keyboard meant for business and work, but can be used for gaming as well. 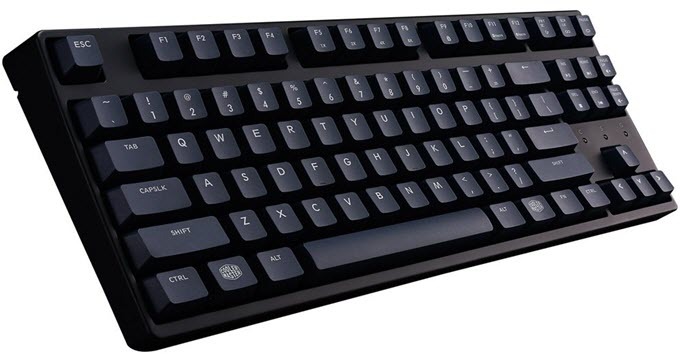 Cooler Master MasterKeys S mechanical keyboard comes with PBT Keycaps that are more durable, reliable and better to type on compared to the standard ABS keycaps that are used in almost all of the mechanical keyboards. These PBT Keycaps are 1.5mm thick and does not fade away or lose their texture and feel in longer run which is the case with ABS keycaps. The TKL keyboard is available in Cherry MX Blue, Red and Brown switches. However, ESC, CAPS LOCK, SPACE BAR and FN keys use Green Switches that are Firm and Tactile. This keyboard packs switchable layouts functionality that allows you to switch layouts between Dvorak, QWERTY, and Workman without need for any software. You can switch between these different layouts on the fly by using FN key with F1, F2 and F3 keys. This special FN key is also used to activate media shortcuts, Windows Lock Key an adjust Repeat Rate. The keyboard also supports Macros and Profiles for your personalization. For gaming, it supports 6-Key and N-Key Rollover anti-ghosting but lacks keycaps backlighting which might disappoint some of the gamers out here. The USB cable is braided and detachable and there are six extra Red colored keycaps (W, A, S, D, Q, E, R) included in the package. It must be noted that these extra keycaps are not made from PBT plastic. So, if you are looking for a solid tenkeyless mechanical keyboard with high quality keycaps and extra functionality then you won’t find anything better than this. Highly Recommended for business and typing work. Corsair K63 is one of the most popular compact mechanical keyboards for gaming. This TKL mechanical keyboard comes with Cherry MX Red switches and Red LED backlighting. It has got dedicated multimedia buttons on the top part that also includes brightness control and win lock buttons. Due to these extra dedicated buttons the keyboard is a bit wider and this makes it a bit less compact in nature compared to other tenkeyless mechanical keyboards out here. However, it is still a pretty compact and lives to the minimalist standards of a tenkeyless keyboard. The keyboard comes with ABS keycaps that feels excellent to type on. The spacebar keycap is textured one and the characters on the keyboards are easier to read due to large font. The keyboard supports Full Key (NKRO) with 100% Anti-Ghosting so that every keystroke can be registered when playing games that involves pressing multiple keys simultaneously. 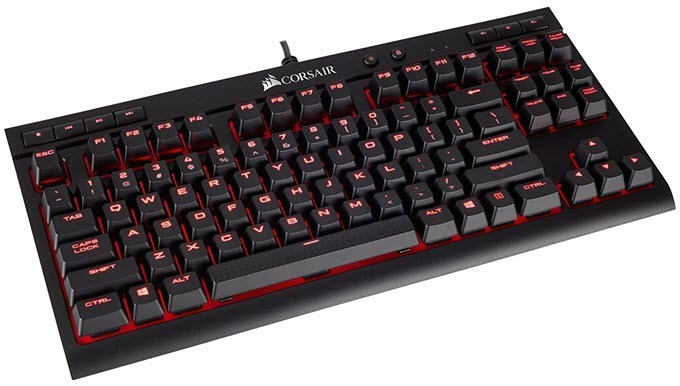 The LED lighting effects on this keyboard can be changed or set by using the Corsair iCUE software which can be downloaded for free from the Corsair’s official website. The keyboard has good build quality and is great for fast action gaming. It officially supports Windows 10, Windows 8, Windows 7 and Windows Vista operating systems. Here we have another Cooler Master Tenkeyless mechanical keyboard but this one comes with ABS keycaps and White LED backlighting. This a ultra minimalist TKL keyboard and comes with Cherry MX Brown / Blue / Red switches. For gaming, it features N-key rollover & 6-key rollover with anti-ghosting technology. The Cherry MX brown variant of this keyboard is very popular because it provides a great balance between gaming and typing. Multimedia and other controls like repeat rate adjustment, brightness control, lighting effects (breathing, light wave etc. ), winlock keys etc. can be triggered using the special function key (FN). A reflective metal plate resides beneath the keycaps for amplifying the white LED to a great extent. The keyboard also supports macros and profiles for customization, and it does not need any software for this. Overall, a well made compact mechanical keyboard that is very well suited for both gaming and typing. A high-quality mechanical keyboard from a relatively unheard Chinese brand ikbc. The keyboard comes with ultra-durable and ergonomic PBT keycaps and is available in Cherry MX Blue and Brown switches. There is no keycap backlighting and the letters on the keycaps are laser engraved. This is a simple yet elegant keyboard with clean looking fonts. For gaming, the keyboard comes with NKRO with 100% anti-ghosting. Don’t mistake this one as a cheap mechanical keyboard because it is not and has great build quality and feels like a premium quality mechanical keyboard. It comes bundled with 10 extra keycaps (5 blue + 5 red) and a keycap puller. Overall, a no nonsense TKL mechanical keyboard that you can safely rely upon and can be used for both gaming and typing. Here are the Best RGB Tenkeyless Mechanical Keyboards for Gaming. They Tenkeyless mechanical keyboards comes with fancy RGB LED backlighting and effects that looks really cool. Most of the below mentioned RGB Tenkeyless Mechanical Keyboards come with genuine Cherry MX switches while some of them have their own proprietary mechanical switches which are equally good in performance. A truly gem of an RGB tenkeyless mechanical keyboard from Corsair. The keyboard features floating keys design and comes with Cherry MX Red mechanical switches that are designed for fast action packed games. A soft touch detachable wrist rest is included with the keyboard to provide comfort during long gaming sessions. The build quality is top notch with metal frame construction to provide the keyboard extra rigidity. The keycaps are made of ABS plastic which is quite common among mechanical keyboards. Corsair Gaming K65 RGB Tenkeyless Mechanical Keyboard has got dedicated media control buttons that are very easily accessible. For gaming it comes with Full Key (NKRO) with 100% Anti-Ghosting. The RGB lighting effects and MACROS on this keyboard can be controlled using the Corsair’s CUE software. The USB cable is pretty thick and is braided for extra protection. This is great gaming keyboard for FPS, MOBA and eSports games, and lets you dominate in them. So, if you are looking for solidly built, high quality and feature rich RGB TKL mechanical keyboard for gaming then this should be in your list. Cooler Master Masterkeys Pro RGB is the RGB variant of the Cooler Master Masterkeys Pro White keyboard. This is a very compact and one of the cheapest RGB Tenkeyless mechanical keyboards with genuine Cherry MX switches (Blue / Brown / Red). All the settings and RGB lighting on this keyboard can be done on-the fly using the special FN key. 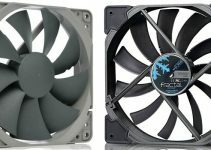 However, if you want to go deep in customizing RGB lighting per key then you can do so by using the Cooler Master’s RGB lighting software. 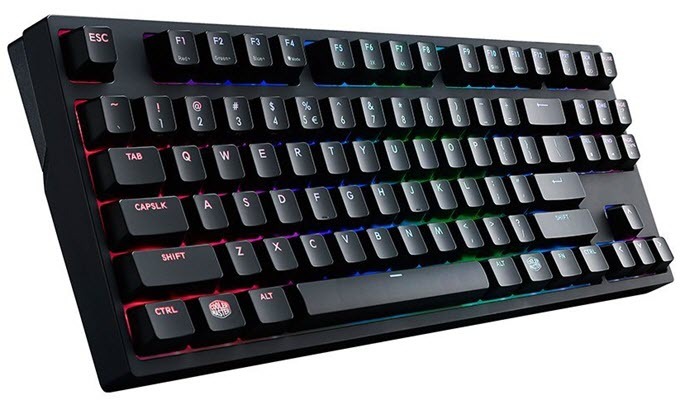 This TKL RGB keyboard also supports MACROS and profiles for customization, and N-key rollover & 6-key rollover with anti-ghosting technology for gaming. The keyboard has a clean and simple design, and it comes with ABS keycaps and a braided & detachable USB cable. It also includes FN key multimedia controls and that is also used for changing RGB lighting, brightness and effects, and for MACROS. Overall, a nice RGB TKL keyboard with original Cherry MX switches and good build quality. The Cherry MX Brown version of this keyboard is very poplar and I highly recommend it for gamers on budget. Razer is a brand that is very popular for its high quality and high-performance gaming mice and keyboards. 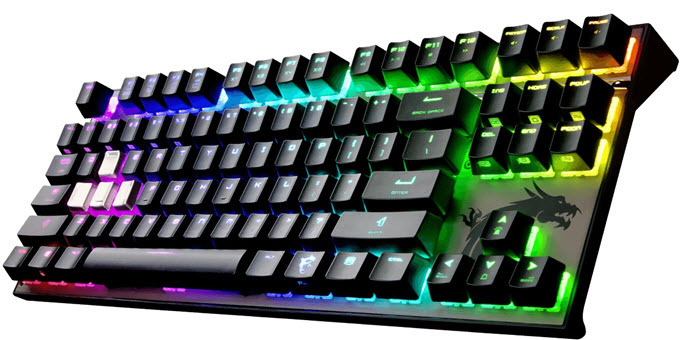 Here we have a RGB TKL mechanical gaming keyboard from it which is Razer BlackWidow X Tournament Edition Chroma. This TKL gaming keyboard uses Razer’s proprietary green mechanical switches. These Razer Green mechanical switches are designed for gaming and are very similar to Cherry MX switches in construction, feel and performance. They are tactile and clicky switches and requires actuation force of 50G, which is almost the same as of a Cherry MX brown switch. The claimed lifespan of these green switches is rated at 80 million keystrokes. The keyboard features floating keys design and has metal frame to provide extra rigidity and solid feel when gaming. The keys are made up of good quality plastic and are lit by RGB LEDs. You can customize RGB lighting and effects using Razer Synapse software and also sync it with RGB Chroma supported devices. The keyboard supports NKRO and Anti-ghosting technology for use in gaming. The keyboard is officially compatible with Windows 10, Windows 8, Windows 7 and Mac OS X.
Logitech is the most popular manufacturer of mice and keyboards, but is not very well known for its mechanical keyboards. However, it has some good mechanical keyboards under its belt and one of them is the Logitech G Pro Tenkeyless Mechanical Gaming Keyboard. This mechanical keyboard comes with Logitech’s in-house Romer-G mechanical switches. These switches feel quite different from the Cherry MX ones as they have lower key travel distance and lower actuation time that results in faster response during gaming. The RGB lighting in this keyboard is brighter and more pronounced because the RGB LED is fitted in the middle of the switch itself. Also, these switches are quieter compared to the Cherry MX blues. The typing experience on this keyboard is mediocre as the Cherry MX Blues and Browns are much better in this respect. The actuation force for these switches is 45g and they are rated for lifespan of 70 million key-presses. 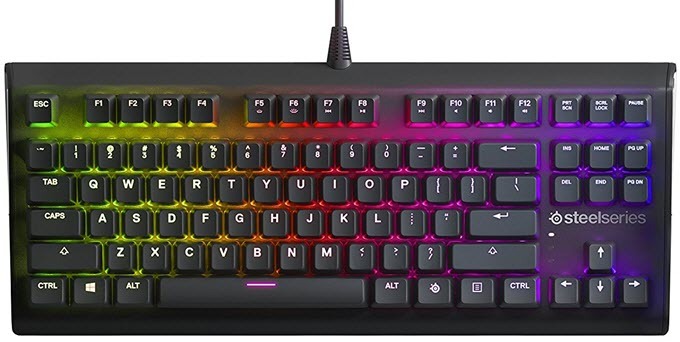 The RGB lighting on this keyboard can be customized using Logitech Gaming Software and can be synced with other RGB Logitech devices using LIGHTSYNC RGB technology. This software can also be used to assign macros on F1-F12 keys and save profiles. This TKL mechanical keyboard comes with a detachable USB cable and has three levels of height adjustment to suit your comfort level. Media key controls can be activated using the special function (FN) key. The keyboard is slimmer compared to the other mechanical keyboards with Cherry MX switches. Overall, a decent tenkeyless gaming keyboard if you are not biased with the Cherry MX switches. 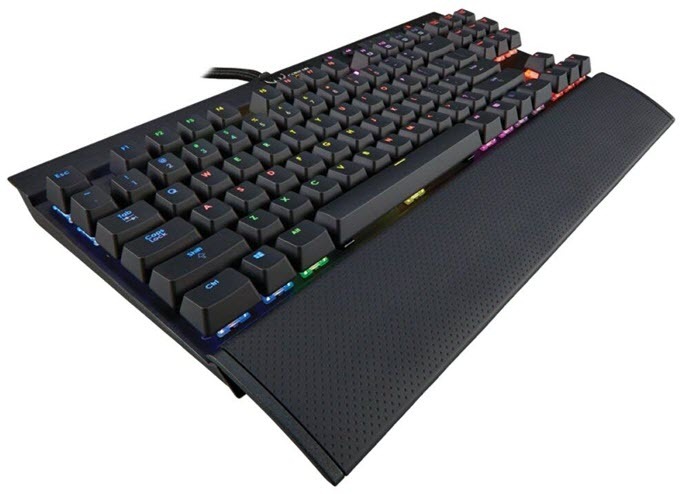 Cooler Master SK630 is a low profile mechanical keyboard having an ultra-slim design This TKL keyboard comes with Cherry MX RGB Low Profile switches that have low key travel, and are super-fast in operation. This chiclet styled keyboard comes with extra-flat keycaps that are RGB lit. The keyboard does not have any Cooler Master branding or name over it, and the only branding that you will notice is the Cooler Master logo printed on the FN key. The keyboard does not need software for RGB lighting customization and Macro recording, as these tasks can be done On-the-fly using its innovative On-the-fly System. Also, the multimedia controls can be used in conjunction with the FN key. The keyboard can be used for typing work and gaming. However, the key spacing is on the shorter side, so it may take some time to get used to it, especially for the users who have used traditional mechanical keyboards for years. For gaming, it does support N-Key Rollover with Anti-Ghosting, and has Windows lock key. One thing that this keyboard lacks is the height and angle adjusters at the bottom, which may not be that of a big deal for many users, as the keyboard natural inclination is pretty comfortable. The build quality of the keyboard is pretty great, and it has brushed aluminum top plate that provides it rigidity, and looks very elegant. The keyboard comes with USB Type-C cable to Type A cable, which is braided and detachable. So, if you are looking for a super slim Tenkeyless keyboard with durable and reliable low profile mechanical switches then don’t look any further, and just grab it now. Here we have another top quality Razer RGB TKL gaming keyboard which is Razer BlackWidow Tournament Edition Chroma V2. This is an advanced compact mechanical gaming keyboard that comes with a magnetic ergonomic soft wrist rest which can be attached and removed easily. The wrist rest has soft padding on it and provides ultimate comfort during long and tiring gaming sessions. The keyboard comes with Razer Green or Razer Orange mechanical switches. The green switches are clicky and tactile while orange ones are tactile and silent. Media controls and other settings can be accessed using the Function key (FN). For gaming, it supports NKRO with Anti-ghosting technology. It features Instant Trigger Technology (ITT) to cancel any debounce delay. The keyboard is powered by Razer Synapse 3 which is a hardware configuration tool to Rebind buttons, assign macros, save profile configurations to the cloud and set RGB lighting and effects (via Razer Chroma). 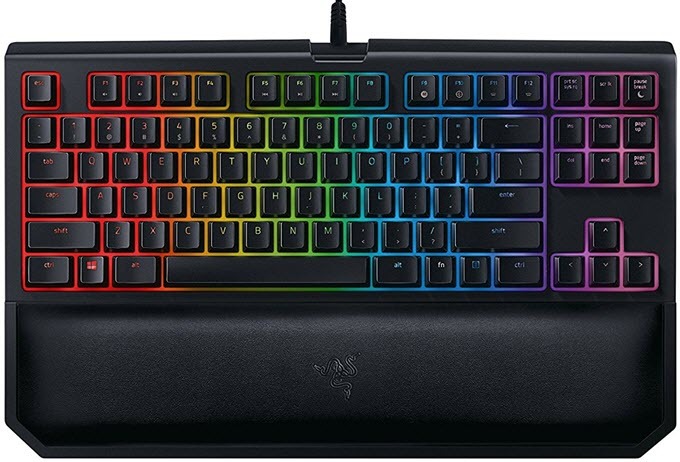 You can also sync this keyboard with other RGB Razer Chroma supported devices. This is one of the best keyboards for eSports gaming and is a popular choice among many eSports gamers. It is also available in Quartz Pink color edition and you can check both of them out from the link given below. SteelSeries is a big name when it comes to gaming grade keyboards, mic, headphones and other accessories. Here we have SteelSeries Apex M750 TKL Mechanical Esports Keyboard that comes with its proprietary QX2 switches. These are linear mechanical switches similar to Cherry MX Red switches having actuation force of 45g and lifespan of 50 Million Keypresses. This is quite a feature rich TKL gaming keyboard that includes some unique features such as customizable Discord Chat notifications, and ImageSync GIF Converter to convert any animated gif into an illumination effect. The keyboard comes with Series 5000 Aluminum Alloy frame for rigidity, stability and provides a rock solid base for mechanical switches. The keyboard has floating keys design and is easier to clean and maintain. The RGB lighting and effects can be set per key or as a whole pattern for the keyboard using the SteelSeries Engine software. Gaming features include N-Key Roll Over with 100% Anti-Ghosting. Media controls can be accessed or triggered using the Function key having SteelSeries logo on it. It supports Windows and Mac OS X operating systems officially. So, if you are looking for compact and feature rich RGB TKL mechanical keyboard for eSports gaming then this is among the best. 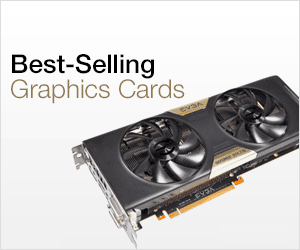 Asus is mainly known for its motherboards and graphics cards but it also manufactures other hardware components and accessories that include mice, keyboards, monitors sound cards, laptops, smartphones, tablets, AIO PCs, routers, headphones. Here from Asus we have ASUS ROG Claymore Core RBG Cherry MX Keyboard which is high quality Tenkeyless RGB mechanical gaming keyboard. The keyboard sports floating keys design has aluminum alloy metal frame construction with some textured Mayan-inspired detailing on it. This keyboard comes in both Cherry MX Brown and Red mechanical switches. The brown variant is more common because of its dual usability i.e. it can be used for both gaming and typing. 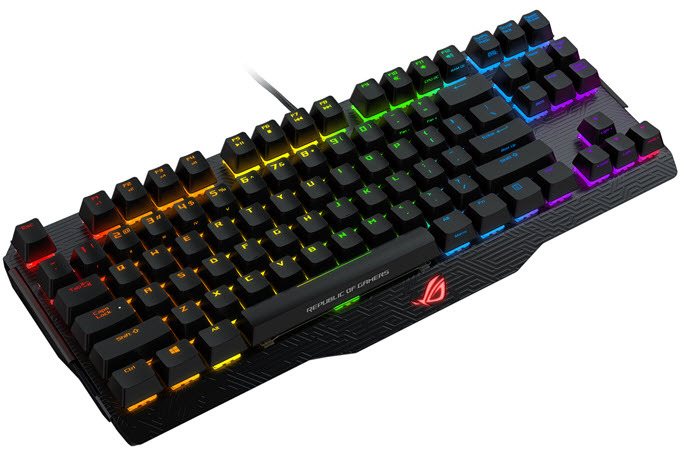 RGB lighting effects on this keyboard can be customized, synced or configured using the Asus Aura Sync RGB utility. Multimedia controls and Repeat Rate settings share function keys (F1-F12) and can be triggered in combination with the special Function key (FN). The keyboard supports 100% anti-ghosting with N-key rollover (NKRO) technology, custom profiles and fully programmable keys with on the fly macro recording. You can also optionally attach ROG Claymore Bond 17-key Cherry MX RGB mechanical gaming numeric keypad to either left (for macros) or right side (for 10-key usage) of this keyboard. The USB cable is detachable there are grooves on the back of keyboard for cable routing. When paired with a ASUS ROG motherboard, you can control fan speed, lighting and overclocking using the defined Hotkeys. If you have an Asus ROG motherboard then pairing this keyboard with it would be a great addition to your gaming rig. Just like Asus, MSI is also a heavy weight in motherboard, graphics card and PC gaming department. 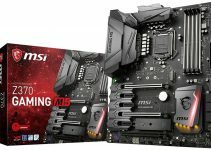 MSI products are known for their high quality and performance. However, it is a relatively new player when it comes to mechanical keyboards, but it never seems to disappoint us and came with a top quality compact mechanical gaming keyboard in form of MSI Vigor GK70 RED. 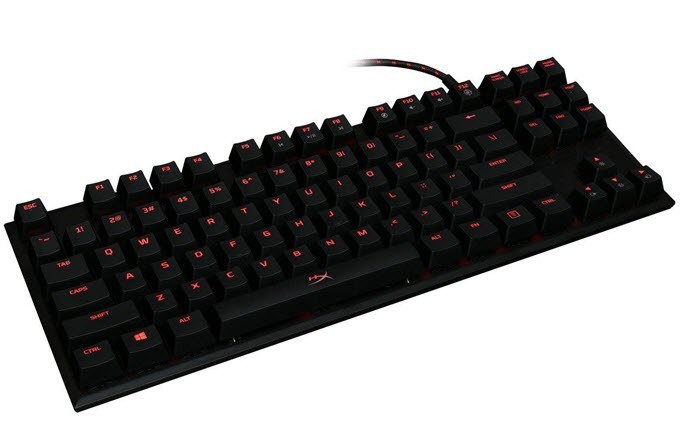 This TKL Mechanical RGB keyboard comes with Cherry MX RGB Red switches that are designed for fast paced gaming and requires less actuation force. This is a floating keys design keyboard and has aluminum body. Gaming features include N-Key Rollover, Anti-ghosting and Windows Key Lock for smooth gaming experience. The keyboard comes with four metal keycaps (made with Zinc Alloy) for WASD keys because they take a lot of hit in gaming, especially in FPS games. Moreover, 12 Double Injection Rubber Keycaps with textured finish are also included with the package. The RGB lighting and effects can be synced and controlled using the MSI Mystic Light Sync RGB lighting software. You can also control various performance modes (OC, Gaming, Silent) of your MSI gaming keyboards and graphics cards using the Hotkeys with this keyboard. These hot keys can be triggered in conjunction with the special Fn key. Other features of this TKL gaming keyboard include MACRO, FN Multimedia keys and Repeat rate adjustment. The USB cable is braided and the back of the keyboard includes three grooves for cable management. This is a great keyboard for DOTA, FPS and MMORPG games and for eSports gaming. This is a fact that Tenkeyless keyboards are very popular among gamers. They also come in very handy in workspace environments where you to save space on your desk. If you are on budget then a normal Tenkeyless mechanical keyboard is sufficient for both gaming and typing work. But if you are enthusiast and want something extra and fancy then you can go for RGB Tenkeyless mechanical keyboards. These RGB Tenkeyless mechanical keyboards do cost extra for their RGB lighting but there is literally no performance gain over the non-RGB TKL mechanical keyboards. 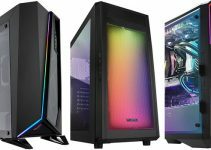 The only thing that you may get besides RGB lighting are some additional gaming features and extra functionality. If you have any doubts or queries in regard to choosing the best Tenkeyless Mechanical Keyboard for your needs then please leave a comment below.